Tiger Woods made a brief appearance in Dubai this week, not for the Dubai World Championship, but to inspect his course which has four completed holes. 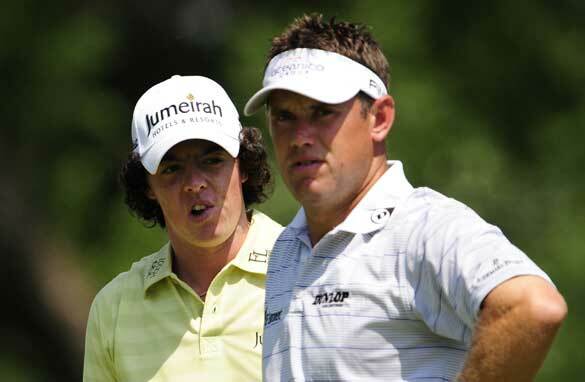 Lee Westwood could overhaul Rory McIlroy in the Race to Dubai standings. Its construction is on hold for the moment. I wonder what discussions took place. It was very much an under-the-radar visit on his way home from winning the Australian Masters and I only found out from some players and agents I know quite well. He’s gone home now so we can all focus on the season-ender for the European Tour and the sprint to grab the loot in the $15 million Race to Dubai. I hosted the pro-am prize giving and opening celebration at the Atlantis on Tuesday night where all the players and their families attended. They are all in a great spirits as they love coming here and making the top 60 to qualify for the richest event must be an awesome feeling. The facilities around the course for the players and public are excellent, even if on the way out here the course appears from a landscape covered with ugly construction sites. Lee Westwood, who has reached number five in the world after collecting a bucket of top ten finishes, is my pick to win the tournament and thus overhaul Rory McIlroy in the Race to Dubai standings and collect the $1.5 million bonus. Lee’s only won once this year but I think we are going to see him break through with a major next year because he’s getting back to his best after months of hard work in the gym and on the practice range. It’ll be a fitting finale if Lee and Rory battle it out to win the Race to Dubai as they have been the most consistent in Europe all season. Sometimes it’s hard to believe that Rory is only 20-years-old because he carries himself as if he has been on tour for 10 years instead of only being in his second. His level of maturity is part of the reason why he copes so well with the pressure of competing at this level and the growing of expectation of him from the public and the media. It’s been a long year for all the players like Rory and the organizers of the Dubai World Championship so I hope we get an exciting finish come Sunday. I am new here and , worrying to close with facts of some things here.